Stumbled upon a new tool today: Flickr Scout by flagrantdisregard.com. Basically it will show you if any of your photos have ever been in the the top 500 interesting photos for the day and gives you some stats about those that have. So far, only my “what’s in your bag” photo has ever hit the list. There are some other strange little Flickr doo-dads at fd’s Flickr Toys page. I haven’t played around with them too much, but some of them look like fun. Today I had a chance to play around with a customer’s MacBook Pro. Supposedly it had been giving them electric shocks, something I was unable to reproduce. 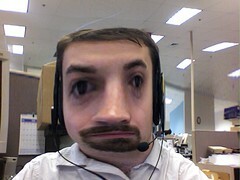 In the process of testing, I messed around with Photo Booth and came out with this. I think it makes me look like Tom Green. Harrison & Ford House Gymnastics is a cross breed of yoga, breakdancing, climbing and gymnastics in a domestic setting. House Gymnastics can be performed by anyone, at anytime, anywhere. I’ve spent days searching for that site, because I when I came across melovescookies flickr account[potentially NSFW], I knew I had seen some of the crazy stuff she was doing somewhere else, but couldn’t remember the site name. My new toy is an HP R817 camera. There aren’t really any pictures that I’m confident enough to show off yet, but you can see a picture of Molly sticking her tongue out at my Flickr page.